Bernd Bruckler spent three seasons in the “Kontinentalnaya Hokkeynaya Liga” in Russia, better known simply as the KHL. Established in 2008, the KHL has quickly become the top European hockey league, with ambitions to challenge the NHL for the hockey supremacy of the world. Bruckler played two seasons with Torpedo Nizhny Novogorod, and one season with Sibir Novosibirsk in Siberia. 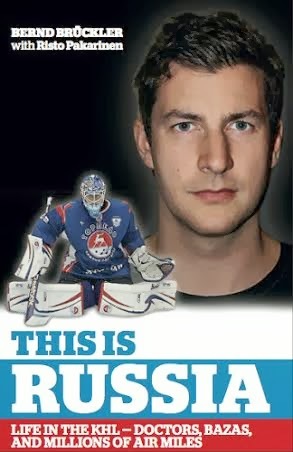 In this memoir he tells what it’s like to be an import player in Russia, and the challenges he faced with the language, the culture, and the hockey. He talks about life in the baza, his teammates, doctors, pills, training camps, the saunas, and the money. Oh the money! “In my three years in the KHL, I saw things I thought I’d never see, but I’m glad I did. Some things were wonderful, others were horrible, and some things were just explained to me as ‘This is Russia’,” says Bruckler, who was the Philadelphia Flyers fifth-round pick in 2001, and a WCHA All-American in 2004. Written with the help of Finnish hockey writer Risto Pakarinen, Bruckler has collected his stories from behind the curtain into a book titled “This is Russia: Life in the KHL - Doctors, bazas and millions of air miles ". It's available on Amazon.com right now, and in book stores shortly.